Combining two very popular trends currently in iPhone gaming, Doodle Blast! is one fine indulgent venture into doodles and destruction. The story behind the game is pretty interesting. Shortly after cranking out Pop Fizz, the developer behind Game Collage got sick with the flu. Wanting to make the best use of his time, but reluctant to invest too much time in something that would just be buried in the App-alanche(pardon the pun), Game Collage decided to see what he could create in a week. After reminiscing over the good ‘ol days with his brother, Game Collage decided to bring back their long-forgotten brainchild and seven days later (just like God! ), Doodle Blast! was born. Though there is an amusingly detailed tutorial included, Doodle Blast! is at its heart, very basic, simple fun. Staying true to their original idea, it’s essentially you and your tank stacked with its ever-expanding arsenal of guns and rockets blowing things up. Each weapon looks and works differently, with some having continuous fire and others requiring a regular tap-tap-tap. I was pleased to realize it has multi-touch functionality so that I could defend myself against both the ground troops and airstrikes. For scorings, there is a global leaderboard as well as Twitter integration to post and compare scores online. Game Collage has a blog detailing the creation process of the game and for those interested, I found it to be a nice representative of the work that goes into any game development. Combined with in-game details like the slow stalling sound of the engine when you pause, insight like that really gave me a renewed respect for developers who take pains in releasing a quality finished product. 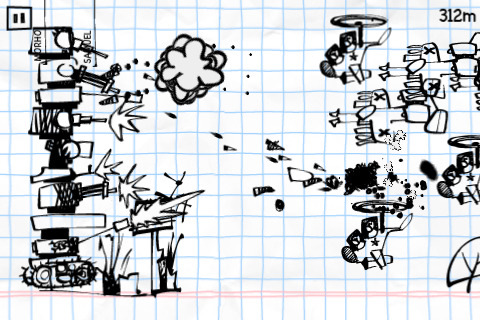 Because the game is relatively simple, some may find Doodle Blast! a little limited but for anyone who’s ever been even a little hellbent on stick-figure destruction may easily find Doodle Blast! a fun little game with little creative details that many can appreciate. Doodle Blast! can be in the AppStore for $0.99. AppSafari review of Doodle Blast! was written by Aucoeur Ngo on March 14th, 2010 and categorized under Action, App Store, Fun, Games. Page viewed 5724 times, 1 so far today. Need help on using these apps? Please read the Help Page.